Tribes across Brazil have secured a historic nationwide victory, preventing Congress from seizing control of the future of their lands. A proposal to change the constitution and give Congress power in the demarcation of indigenous territories has been shelved following months of vociferous protests by thousands of Indians, representing dozens of tribes. 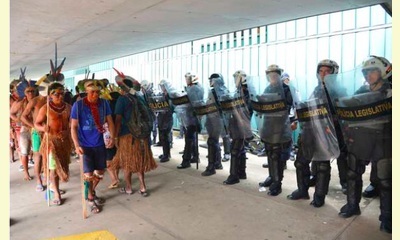 Last week, dozens of Indians traveled to Brasilia and entered the Congress building to make their voices heard. Five were arrested during the protest, and have since been released. If passed, the proposed constitutional amendment, known as ‘PEC 215’, would have caused further delays and obstacles to the recognition and protection of the tribes’ ancestral land, on which they depend for their survival. Alongside several other proposals, PEC 215 was a result of pressure by Brazil’s powerful agri- business lobby group which includes many politicians who own ranches on indigenous land. It threatened to spell disaster for tribes such as the Guarani who have been evicted from most of their land and who face appalling living conditions and one of the highest suicide rates in the world while they wait for the government to fulfil its legal duty to map out their land, and Brazil’s numerous uncontacted tribes – the country’s most vulnerable societies. 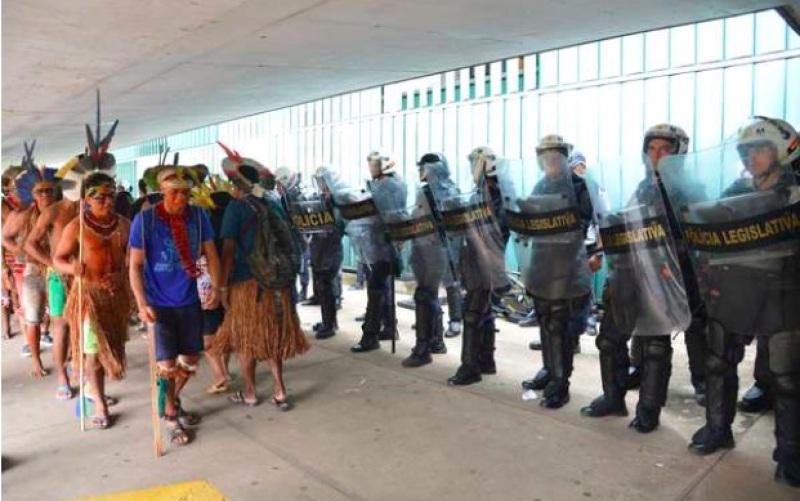 Brazilian Indians continue to fight against the invasion of their lands by loggers, miners, ranchers and others, and against a series of Amazon mega-dams which threaten to destroy the livelihoods of thousands of Indians, and wipe out some uncontacted tribes. This report was posted on January 3, 2015.